Only a few short hours ago, I presented the difference between the Amex Green Card and Gold Card. It turned out the two cards were pretty darn similar. Sadly, my analysis doesn’t stop there. I say sadly because I’m tired of typing, but I digress. Just like Green and Gold, it’s a charge card, meaning you must pay your entire balance in full each month. There’s no credit card APR, and thus no finance charges, only late fees if you fail to pay in full by your due date. Nor is there a pre-set spending limit, though you probably can’t go out and buy a Ferrari with if unless you’ve proven yourself to be a big shot. Let’s take a look at what Premier Rewards Gold offers that the others don’t. The biggest draw to the Amex Premier Rewards Gold is the 50,000 Membership Rewards points offered as a bonus to new cardholders. As long as you spend at least $2,000 in the first three months of cardmembership, you can get that healthy bonus. Be sure to hold out for the 50k bonus as opposed to the lesser 25k sign-up bonus that is often featured on the American Express website. The 50k bonus is typically targeted so look out for it before you apply! For me, 25k isn’t worth signing up for. If you convert those points into gift cards, you’re looking at a $500 value. But if you transfer them to airline partners, their value could be worth thousands! With the plain old Gold Card, you don’t get any upfront bonus whatsoever. So advantage Premier Rewards on this front. Additionally, the Premier Gold Amex version waives the annual fee for the first year, as the regular Gold does. However, the card carries an annual fee of $195 after the first fee-free year. Ouch! It just increased from $175 on June 1st, 2015. 3X Points on Airfare, 2X Points on Gas, Groceries, and at Restaurants! 2X on gas, groceries, and restaurants within the U.S. But there’s a reason the annual fee is steeper. You get an actual rewards credit card, unlike the standard Gold Card, which only offers one point per dollar spent. Lame. With the Premier Gold Amex, you get triple points on airfare, double points on gas purchases made at U.S. stand-alone gas stations, double points at U.S. stand-alone supermarkets, and 2X points at U.S. restaurants. Kind of a bummer that it’s only for U.S. locations only, seeing that Amex caters to the jet-set, but the good news is the categories stay put, unlike the rotating ones tied to other rewards credit cards like Chase Freedom and Discover it. So all of a sudden the Premier Rewards Gold Card shows us why is it indeed premier – it’s a rewards card with a big opening bonus that blows the standard Gold Card away. For the record, you also get a Membership Reward point for every dollar spent elsewhere, just like Gold and Green. When using the Gold/Green cards, you can earn an extra point per dollar spent when you book on the American Express Travel website. Update: The Premier Rewards Gold Card now offers 2X points at restaurants too! 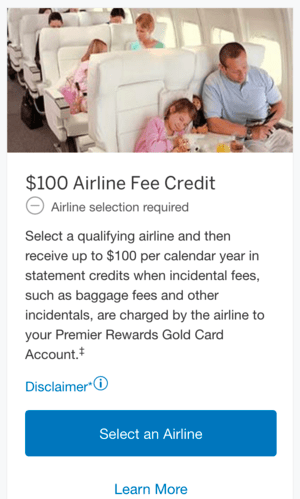 Another newer feature of Amex PRG is the $100 incidental airline credit offered annually, similar to the $200 one that comes with Amex Platinum. Just like that, the $105 Southwest Airlines charge is magically erased down to just $5! You do have to select an airline first, which you are also able to change once each calendar year. I went with Southwest the first year. Other options include Alaska, American, Delta, Frontier, Hawaiian, JetBlue, Spirit, and United. It doesn’t stop there folks – if you spend at least $30,000 per calendar year ($2,500/month), you get an additional 15,000 bonus points. Seeing that they’re valued at $150 if you redeem for gift cards, you could walk away with $650 in bonuses in the first year alone. Factor in the $30,000 in spending, and you’ve got a total of $950+ in Membership Points, depending on where you use the card most. Update: This 15k spending perk is no longer offered, not that it was necessarily the best deal anyway. It might be possible to earn 75k points with Amex PRG instead. Either way, the Premier Rewards Gold is no match for the regular Gold Card. And it only costs an additional $35 per year in the way of annual fee. Your $500 opening bonus covers you for 14 years if you look at the difference in annual fee alone (14x$35=$490). Other than that, we’ve pretty much covered the difference between the Premier Rewards Gold Card and the regular Gold Card. You get the same perks, like hotel/resort credits and upgrades at Gold Hotel Collection properties, as well as Equinox gym discounts and benefits. Additionally, you get all sorts of insurance, from baggage to car rental to travel accident, as well as purchase protection, extended warranty, and dispute resolution. There’s also the roadside assistance with no mileage limits, just like the standard Gold Card. One downside to this card is that it does carry foreign transaction fees (2.7%), which is a bummer for such a pricey card. To sum it up, if you charge a decent amount each month, this card is clearly the one to go with compared to the Gold and Green versions for the opening bonus alone. Also be on the lookout for the Business Gold Rewards Card, which offers a bonus of 75,000 points when you spend $5,000 in the first three months. That should be enough to fly in style just about anywhere in the world! In a nutshell, I wanted the 50,000-point sign-up bonus. It’s the best points haul you can get from American Express with the lowest annual fee. Also, the annual fee is waived the first year, so really you don’t even have to worry about it if you cancel the card before it’s charged at the start of year two. You also get the calendar year $100 airline credit, which amounts to another $200 in value if used in both the first two years. I wound up using my 50,000 Membership Rewards points for a flight to Europe. I transferred my points to British Airways, then onto Avios and used them to book a business class flight on Aer Lingus. The retail cost of the flight was thousands of dollars, so the value of the MR points was pretty amazing. That being said, it certainly helps to have a redemption in mind before applying for one of these cards so you can make the most of your points and avoid paying annual fees for no good reason. If and when you cancel the Amex Premier Rewards Gold card, you might be offered a retention bonus to keep it open. Credit card companies basically want to keep you aboard, so they’ll do whatever is in their power to retain you as a customer. My particular offer was a decent 5,000 MR points immediately, and an additional 15,000 if I were to spend $3,000 in three months. All told, that would net me at least 23,000 MR points, which is nothing to scoff at, but I passed because the $195 annual fee is a bit steep. Sure, you can get $100 off the annual fee via the annual airline credit, but I’d rather just go after another sign-up bonus. I was a little conflicted on the offer though because it was fairly enticing, and had I needed the MR points for something specific, I probably would have bitten. 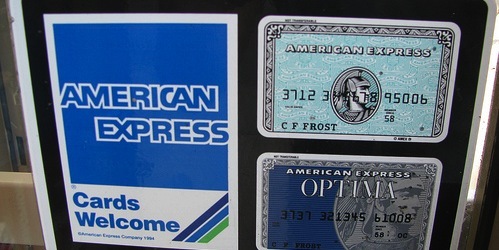 Read more: Is the American Express Platinum worth the $450 price tag? If you’re choosing between regular Amex Gold and this, there’s no question that Premier Rewards Gold is the better option. Good sign up bonus for an Amex card. They can be stingy. And good multiples in the points categories. I’m confused, why settle for 2x points on groceries when you can get 6x on groceries with their Everyday card? You bring up a good point, but the long and short of it is that some people want points instead of cash back, so this works for them. But I agree that the higher multiples are a better deal. You can always earn points with different credit cards, like Chase. Better yet, find a targeted offer that has a 50k or higher signup bonus. It’s a points vs. cash back thing people. Points can have tremendous value over simple cash back. Much, much better than standard Amex Gold. Definitely go with this card if comparing the two.